Amos, the Texas goat protector. The picture attached is our goat dog Amos. 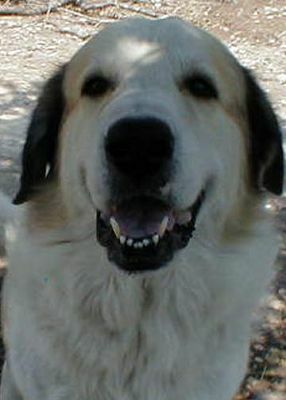 He is a Great Pyrenees. It is necessary to have some type of protection for your goats from wild dogs, coyotes etc.. You put a donkey, llama, or dog in with the goats when the animal is weaned from it's mother. From then on you treat it like a goat so it will bond with the other goats. The "protector" eats when the goats are fed. We have had Amos for 6 years now and he thinks he is a goat. When the goats have kids he watches and he actually eats the afterbirth. The goatkids grow up jumping on him and he baby-sits them when the older goats go grazing. The only goat story I can think of right off hand is the following. My uncle Jimmy had a beautiful Cadillac Seville, yellow in color with a leather interior with CB and 8 track combo. He would never let me drive that car. Boy how I wanted to. When my uncle passed away he left me the car. It was in mint condition and to me it was brand new. I drove my new cherished car home and parked it outside the trailer then went in the house to get my husband to surprise him and show off my car. When we walked out of the trailer I gasped as the goats had all jumped on the car and were having a blast playing King of the Mountain!